Not even a quarter of the way through unpacking boxes of books (all of which need to be cleaned first), I came upon the boxes of maps – maps of cities, states, countries – piles upon piles of them. Some folded neatly, some with no hope of ever being folded again. Some ripped to shreds. Some with red magic marker detailing a route. Some so old there probably aren’t the same roads anymore. I debated about keeping the maps but for me, the Queen of the Directionally Challenged, paper maps actually HELP me. Even with GPS in the car and on the iPhone, there are some times when a paper map is really the ONLY way to see which way to go – literally and figuratively. Mr. EOS swears by maps, says it orients him and from there, he can put the map down and can “see” which way to head. Sure. 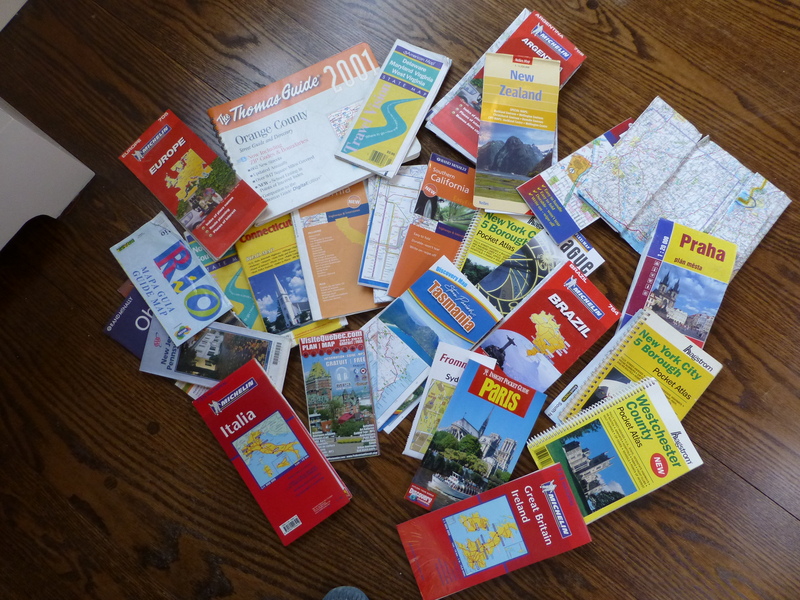 Then there are all the guide books – perhaps these, more so than maps, have little to no use. The last trip we took we used a digital city app for touring. I can remember on some long trips, like the one to Vietnam, Thailand, and Cambodia, we practically needed another SUITCASE for all the guide books we brought. They weighed a ton and there was always “discussion” about who was stuck carrying them during the day. Of course, the best part of making the decision to keep or toss the maps and books, is that no matter what, we’ll always keep the memories stored of some fabulous journeys around this amazing world. 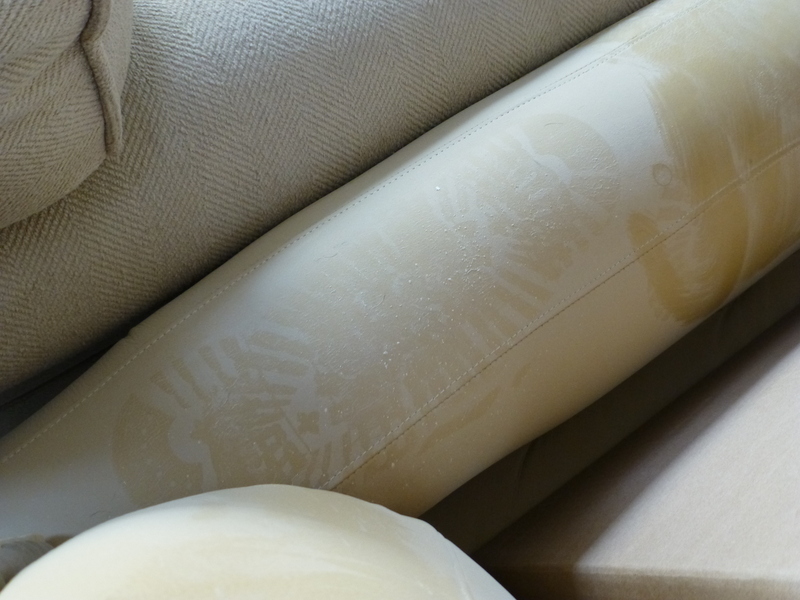 As an aside, while moving furniture around to get in queue to be cleaned, we saw this rather disturbing boot print on TOP of a glass hutch and a second on a leather chair. Both were covered but it says either the painter we fired or the sheetrocker decided they didn’t need a ladder. Pretty awful, and nervy, if you ask me. Those are great bookshelves. Would love to have a space like that in my home. Thanks Abundant! 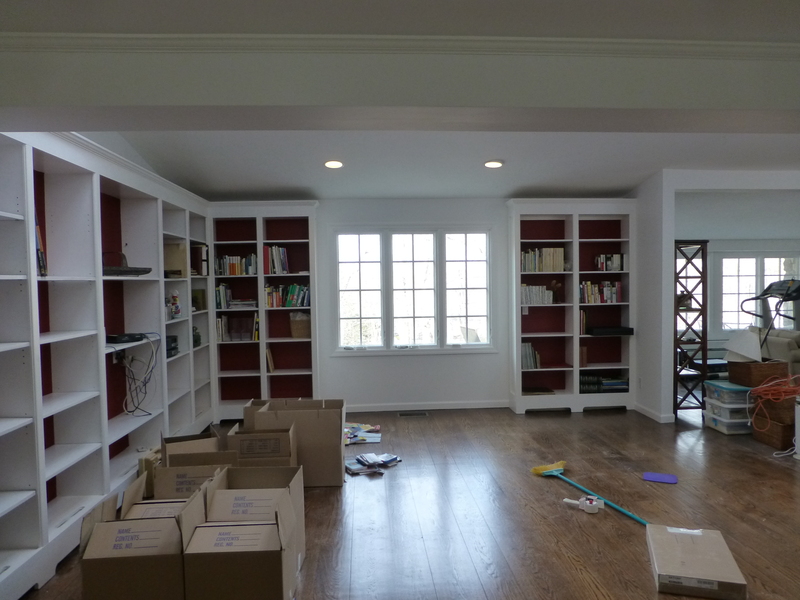 We are just finishing a house reno and added some more bookcases. There’s never enough storage. Keep the maps and the books. We do some of our best teaching to the grandchildren by opening up maps. It opens their entire world. I have an old globe that the little ones love to spin and it gives them a good perspective when we open a specific country map. Is there a place on your bucket list you haven’t been to? China. We’d like to go there next. 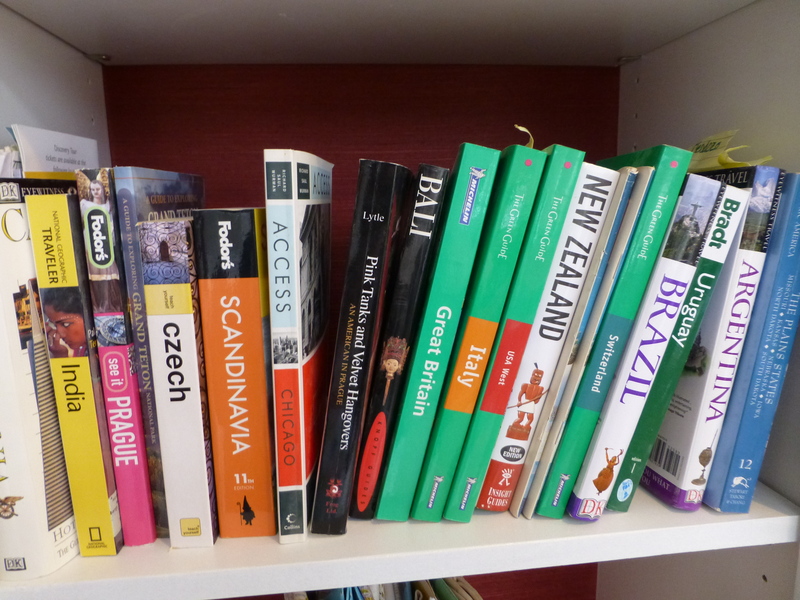 I’d keep the maps and guidebooks just because. Discovering those footprints would really make my blood boil. How do you plan to use your beautiful new library? Just because is a good enough reason for me too. They have found a nice new basket to sit in, on the shelf below the guide books. The GC is due any minute with the town inspector for the final walk-through for my CofO. It’s not the right time to show him these footprints but you betcha I will. The final bill has not been handed to me yet, and with the help of my architect-negotiator, I will address this problem. The GC already knows I had issues with some of his subs and he knows he did not earn the privilege of doing phase two, if/when that comes to fruition. I guess THAT in itself is the best way to deal with it. Would you do anything that I haven’t thought of? I don’t think you have to do much at all. The contractor won’t use you as a reference. What is more important is that your architect is unlikely to ask him to bid on future jobs. What’s peculiar is that the architect (whom I adore) and this GC go way back. Millions of dollars worth of work with the two of them on board. My architect is disappointed with the GC lack of supervision and you are right to say that when the architect is unhappy, he won’t make as many referrals. Nothing horrible happened here. The work done was decent enough – not perfect, and I did have to step in enough times that made me less interested in paying the GC his fee, but it’s over now, I can sit back and breathe a bit. The town inspector, who I know well, came by and will pass me easily for the CofO. The GC came early, the inspector was late. Oddly, the GC left before the inspector came. Didn’t even bother to knock on the door or tell me he was leaving. But it actually was fine since I know my house inside out and backwards and it’s easy for me to talk to the town guys. You could wallpaper a room with those maps — or use as gift wrap. You know Up-cycle them. Those footprints are just awful, lucky they didn’t break right thru the hutch. Great idea SB. I’ve seen gifts wrapped in maps. And rooms wallpapered too. In nautical maps. 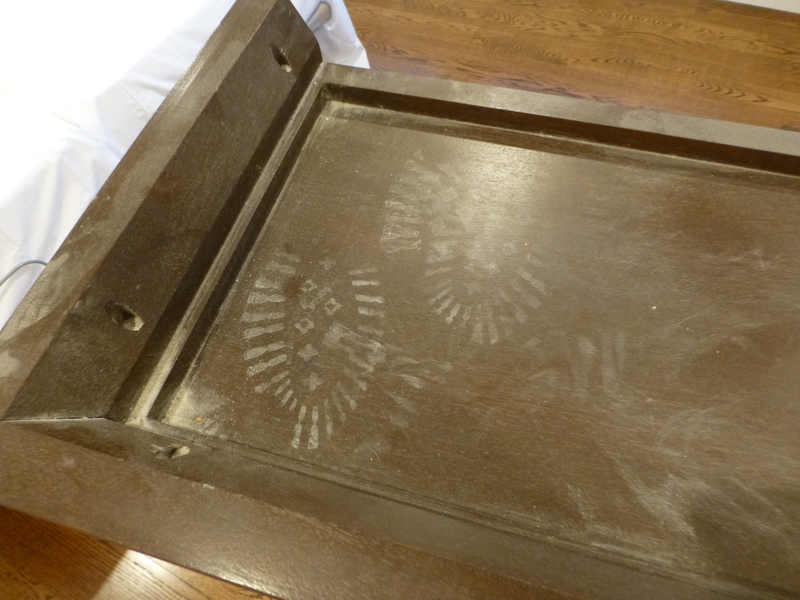 I have no idea how whose ever footprint it is DIDNT go through. The top is not all that sturdy- it’s basically a lip to hold the crown molding of the piece. It’s beyond awful. I’m with you on the usefulness of paper maps. Of course, “She Who Must Be Obeyed” — the dynamic voice and map in the car GPS — is really useful, but it doesn’t give you the same confident visceral sense of which way you’re heading and how long and complicated the trip will be. I think maps are comparable to round analog clocks — the size of that slice of pie tells you a lot about you how much time you actually have — and also paper calendars — that layout of squares for the week April 1 to April 8 gives me a much better sense of the urgency (or lack of it) of things coming my way than an iPhone calendar. 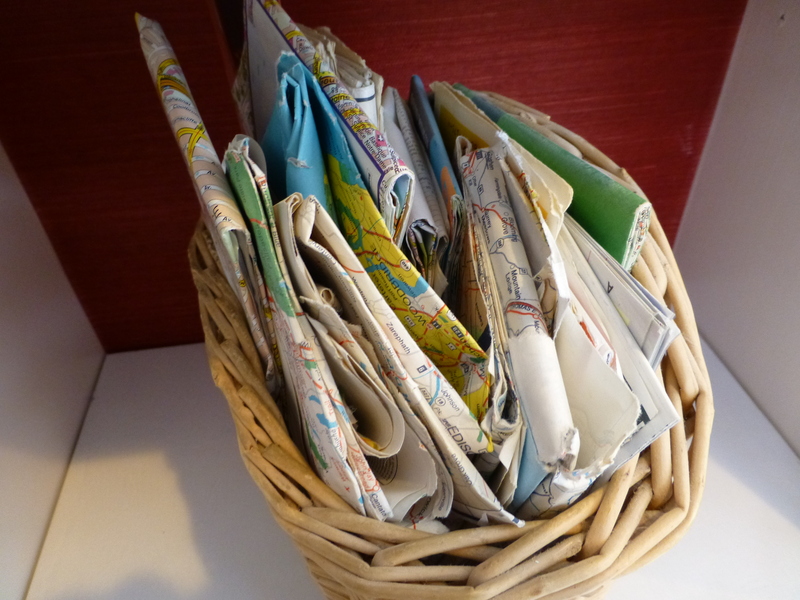 Sound Beacher … what wonderful ideas for maps with sentimental value! I will think about that around here. ← Because Who DOESN’T Want a Pound Cake Candle?? ?